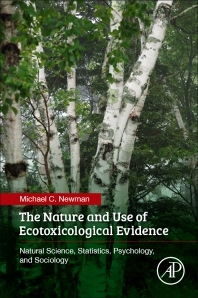 The Nature and Use of Ecotoxicological Evidence: Natural Science, Statistics, Psychology, and Sociology examines how toxicologists and environmental professionals come to understand and make decisions about possible harm from pollutants. Drawing on concepts and techniques from the natural, social and mathematical sciences, the book emphasizes how pollutant-related evidence is gathered, assessed, communicated and applied in decision-making. Each chapter begins with a real-world example before exploring fundamental cognitive, social, statistical or natural science concepts to explain the opening example. Methods from other disciplines for recognizing, reducing or removing the influence of impediments in wise decision-making are highlighted in each chapter. Misreading evidence by the scientific community, and miscommunication to regulators and the public, remain major impediments to wise action in pollution issues. Which evidence comes to dominate the dialogue among scientists, regulators and decision makers depends on social and scientific dynamics. Yet psychological and sociological factors that influence the movement of evidence through scientific communities to regulators receive cursory discussion by professionals unfamiliar with the sociology literature. Toxicologists, environmental scientists, psychologists and professionals and students across the sciences will find the book useful for understanding how evidence is generated, assessed and communicated in their own fields. Michael C. Newman is currently the A. Marshall Acuff, Jr. Professor of Marine Science at the College of William and Mary’s School of Marine Science where he also served as Dean of Graduate Studies from 1999 to 2002. Previously, he was a faculty member at the University of Georgia’s Savannah River Ecology Laboratory. His research interests include quantitative ecotoxicology, environmental statistics, risk assessment, population effects of contaminants, metal chemistry, bioaccumulation and biomagnification modeling, and during the last 15 years, qualities of new concepts or technologies that foster or inhibit their adoption by the ecotoxicology scientific community. In addition to more than 140 articles, he authored 5 books and edited another 5 books on these topics. Mandarin and Turkish translations of his Fundamentals of Ecotoxicology are available from Chemical Industry Press (Beijing) and PALME (Ankara). A Mandarin translation of his marine risk assessment book was released in 2011. He taught full semester and short courses at universities throughout the world including the University of California – San Diego, University of South Carolina, University of Georgia, College of William and Mary, Jagiellonian University (Poland), University of Antwerp (Belgium), University of Joensuu (Finland), University of Technology – Sydney (Australia), University of Hong Kong, University of Koblenz-Landau (Germany), Huazhong Normal University (P.R. China), and Royal Holloway University of London (UK). He served numerous international, national, and regional organizations including the OECD, US EPA Science Advisory Board, US EPA ECOFRAM, US EPA STAA, and the US National Academy of Science NRC. He was a Fulbright Senior Scholar (University of Koblenz- Landau, Germany, 2009) and a Government of Kerala Scholar in Residence/Erudite Scholar (Cochin University of Science and Technology, Cochin University, Kerala, India, 2011). In 2004, the Society of Environmental Toxicology and Chemistry (SETAC) awarded him its Founder’s Award, “the highest SETAC award, given to a person with an outstanding career who has made a clearly identifiable contribution in the environmental sciences.” In 2014, he was also named a SETAC Fellow, for “long-term and significant scientific and science policy contributions."